I want to share with you the fruits of many years’ trials and errors. The way has been long and hard and strewn with smoke-blackened bits of poultry, even carbonised pieces of what was once flesh doing a convincing imitation of the fuel with which I had started. No, what I am talking about here is cooking delicious, moist, yet crispy chicken, while employing charcoal in the open air. I know this sounds odd, impossible even, but follow me closely and you will be fine. Just a word of warning. There are men (and, I suppose, a few women) who regard barbecuing as (a) the only form of food preparation that they will deign to undertake and (b) the indiscriminate application of heat, and as much if it as possible at any given time, to items of food. If this is you, my words will be of no use. Believe me, unless you cook on a pretty regular basis you’re just not going to get it. We’re talking some instinct and sensitivity here. If you’re a bit of a troglodyte who enjoys making fire, stick with the burnt sausages. A word about the barbecue apparatus. I suggest one of those round, domed ones. The most famous and wildly overpriced are made by Weber; ours is built along the same lines but cost very little many years ago. Whatever kind of barbecue you use, it has to be fuelled with charcoal (not gas and lava rock) and it has to have a lid. A full day before you want to eat it, dismember a chicken. You need to cut it into two legs, two thighs, two wings and two breasts, on the bone, which you then break down into six chunks of meat (on the bone). Drop all of these animal parts into a capacious bowl and follow them with the grated zest and squeezed juice of a lemon, the smashed and mashed contents of a whole bulb of garlic, lots of fresh thyme which has been rubbed thoroughly between your (very clean) palms, oodles of black pepper and a glug of olive oil. Mix all together with your bare (very clean) hands and don’t forget to wash your now very dangerous hands before covering the bowl and putting it in the fridge or in a cool larder for 24 hours or as close to that as you can manage. Mix again five or six times during this period of marination. Using chicken wire (how appropriate!) or some other material, divide the bowl of your barbecue in two. Fill one half with lots of charcoal (rather more than you think you will need), apply lighter fuel, let it rest for 30 seconds, then set fire. After half an hour the charcoal will be about ready for cooking. Level it, pushing out to the sides, and place the cooking rack above it. When the barbecue is ready for action, brush the rack with oil and get ready to lay down your chicken pieces. You will do this on the side where there is no charcoal, placing the legs and the thighs closer to the middle, the chunks of breast on the bone behind them and, taking up the rear, the wings. Brush the chicken liberally with melted butter and put the lid on the barbecue. 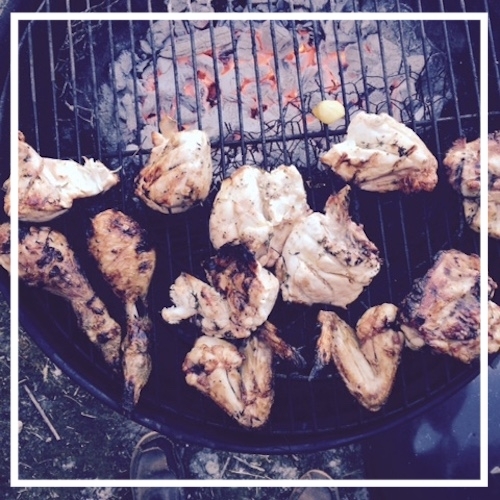 After a few moments, check that the chicken is not dripping on to hot charcoal; this is the whole point of the exercise. Brush again. Turn the meat and brush liberally. It is not physically possible to brush with too much melted butter. Just keeping doing it, and turning the chicken, making sure that it doesn’t burn. If you feel some bits are threatening to do so, move them away from the centre line of the barbecue and cover with aluminium foil for a while. However, you need to keep the lid on when not basting or turning. Keep the vent fully open and positioned above the chicken. How long does it take? Look, this isn’t really a recipe. You have to judge for yourself. I reckon, on average, about 15 minutes. The charcoal will be cooling down all the time but it will retain lots of heat. When you think the chicken is done – moist but cooked through, the skin deliciously crisped – it probably is. This way with chicken is very effective for wings, by the way. You just need to keep a closer eye on them, when doing a whole lot of wings, to prevent burning, and to employ the foil trick. The key thing to remember here is that you are using indirect heat. Never put the chicken over the coals; all drips will flare and cover your lovely marinated chunks of meat in an oily, black laminate that tastes awful. We eat this kind of chicken feast with some new spuds from the garden and a simple green salad (from the same) dressed with a mustardy vinaigrette. A rosé like the Provençal one from Aldi at €8.99 is just the ticket as far as wine is concerned.